The US Army's next-gen night vision goggle will have wireless networking capability, allowing them to linked the thermal weapon sights carried on some soldiers' firearms. Think of it as Bluetooth at a very deadly level. Not only will the sight crosshairs be superimposed in free-floating "augmented reality" in the goggle display, but the thermal imager's own unique optical picture will also be integrated directly. What that means is even when soldiers are in total darkness, they won't have to shoulder their weapon before accurately engaging a target. Instead, they can simply throw the thermal imager's crosshairs on the the bad guy and fire off a burst. The system will be especially useful for light and medium machine gun operators, and it will greatly expand their situational awareness while increasing their ability to make quick reflexive shots in combat conditions where any efficiency can mean the difference between life and death. 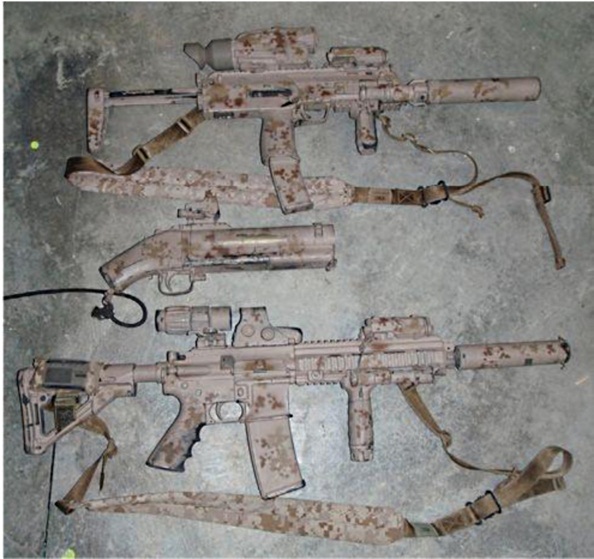 Even much lighter weapons, like the ultra-compact Heckler and Koch MP7s that some highly elite special forces units use, can be paired with this system to great effect. In many situations, thermal sights can see more than night vision alone. This is true especially in dense foliage, light cover, smoke, dust or adverse weather conditions and when targeting enemies at longer range. Snipers will also be able to use their cumbersome rifles in closer combat scenarios while also maintaining a large field of view and enhanced situational awareness. Paired with the proper training and tactics, it will give soldiers a clear edge over the enemy in critical situations and will provide a more seamless Predator-like heat-sensing infrared vision capability than ever before. "The technology, called Rapid Target Acquisition, merges two separate Army developmental efforts to engineer, deliver and combine new, upgraded night vision goggles, called Enhanced Night Vision Goggle III, or ENVG III, with next-generation thermal weapons sights—called Family of Weapons Sights – Individual, or FWS-I. The Army plans to acquire as many as 40,000 ENVG IIIs. ENVG III is being engineered to easily integrate FWS-I as soon as it is slated to be operational in 2018." Things are moving fast in the wearable technologies and augmented reality space. Eventually, multi-spectral imaging and weapon sight fusion will be incorporated with other forms of information into the soldier’s helmet-mounted display. Superimposed digital tags showing where friendly and enemy forces are in the sky and on the surface, mapped routes, geolocation-triggered mission notes and many other things will be displayed synthetically before the average soldier's eyes. Meanwhile, being able to snap off a burst from the hip without sacrificing precision—and being able to do it in total darkness—is right out of Hollywood action movies. The truth is this will save the lives of many friendly forces while taking many more of the enemy's. This is especially true in urban warfare and close quarters combat, arenas of warfare notorious for degrading a technologically superior force's edge.